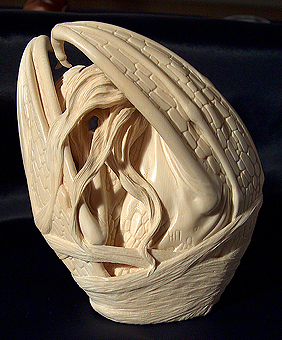 Two days ago I finished my sculpture, the size is 8.7 cm, mammoth tusk. that is a truely remarkable piece of work, breathtaking in fact. Your ability to convey emotion through such small scale studies of the human form is wonderous. I remember reading on your web-site that you enjoy physical excercise, your sensitivity to the body is very evident. Very insipiring. now I can return to my own studio with even more enthusiasm. Thank you. That's an amazing piece of work. I remember you asking for images of bat wings, and now to see the result is astounding. 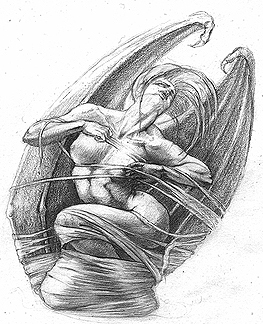 Do you have any preliminary drawings you'd like to scan and share? "Wow", "That's Incredible", "Oh my! ", all from my men when they walked by and took a long look at the images. You are so phenomenal! Words like “Incredible” and “Visually Stunning” seem like understatements when I look at this piece. 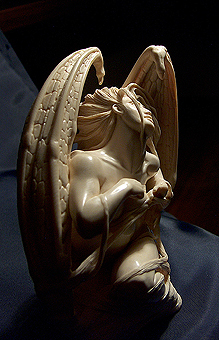 The first thought I think when looking at it is the creation of Lucifer as the figure looks like an Angel but the bat wings suggest evil. The figure looks female, but I can't help thinking along those lines. Thank you for sharing pictures of your work. It's been quite a while since we've heard from you - - I was sure you were deep into your work on this magnificent piece. It's finished! Words fail me - thank you for sharing your soul with all of us. This work inspires me so much - I feel I must give my all to my work - every thing I've done before I realize has been like excercise - now I must put my true heart into my work, holding nothing back. Thank you Natasha. Thank You all, my dear Friends! Every of your words like a balm! Especially I would like thank Janel and Peter Welsh for helping with photos of the bat wings! 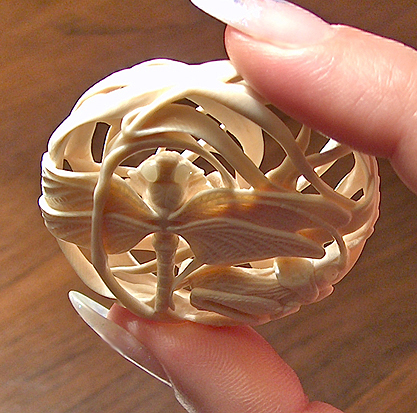 It was really very difficult work, the beginning was with power-tools, then everything was done with hand-tools, I used all tools which were done for the Ryusa style netsuke, such places as places under the wings and between threads of cocoon were very awul for me, but I so adapted at Ryusa, so I could carved it at last! Thank You, my dear Friends! Every word is like a balm! I began to carve with the power-tool, but almost all work was done by hand-tools, there were so many small details which were not for power-tool. I'm glad that this difficult adventure was finished! 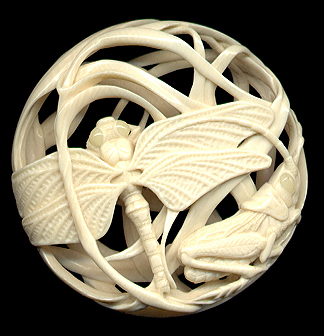 I used all tools which were made for the Ryusa style netsuke, such places, as the places under wings and between threads of the cocoon were very difficult! 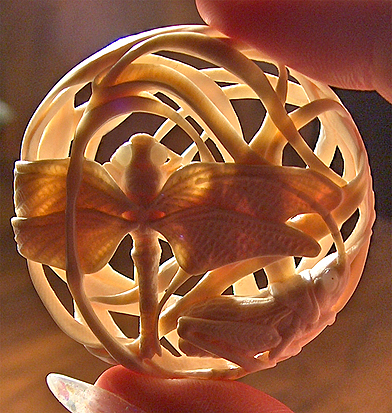 So my experiment with netsuke helped me with the sculpture! 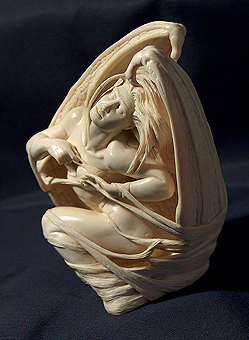 So the next work will be one more Ryusa style netsuke! Something wrong with my computer............... Sorry! Absolutly stunning Natasha, the smoothness and detail of the skin is amazing. May I ask how many hours a peice like this takes to do? When words fail me, I might mutter "holy smokes" (rural American vernacular) under my breath as a quiet expression of awe. Phenomenal work Natasha. Thank you for sharing. I wondered about the subject matter "the last breath". I'm sure you could capture it with dignity, power and beauty. Thanks for the drawings. I always like looking at the preliminary steps artists take in creating. It sure is a stunning work of art Natasha! It's beautiful! What did you use to polish all those tiny grooves? The piece looks so smooth all the way round. Rex Pepper, I have spent on this "Breath" 227 hours....... among them about 100 hours for polishing! Jim, I have no idea about "The last Breath" but thank You for so great idea! I didn't think about it yet! Ekrem, tomorrow I'll have more time for writing, I'll write my secret of polishing, because to use any oil for mammoth or bone is not good idea, I'll also show some photos for the best understanding! Thank you for helping us understand the process. I was wondering if you have any photos of this piece when it was just roughed out or blocked in. 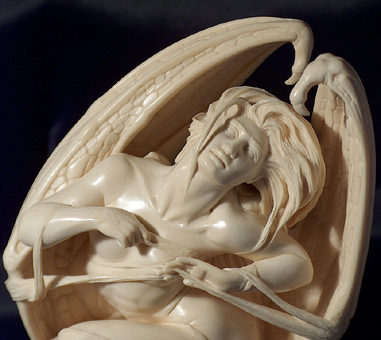 Though the finishing details must take up most of the time, it seems that the initial roughing out of the shape and composition must be very important as it dictates so much of the dynamics of the carving. Does this make sense? The first photo is the covered netsuke, the second was not covered yet. Oh, an interesting effect of visible through. Be still my heart, I cannot believe the delicacy of this piece! Thank you for sharing it with us! What do you use as a "clear disolvent" when making a solution of the parafin? And, is the parafin you use a solid, white wax (commonly used by people who make sweet fruit jams and preserves, to seal in the jam by melting and pouring onto the hot fruit mixture). I ask because I have heard the word parafin used to describe what I call kerosene. Hi, my dear Janel! It is so strange our languages!!!!! The kerosin can be used as a desolvent, the paraffin is often used for producing candles. I take a white candle, cut it mamy many times and put in kerosin! So, there is no tasty things! About my tools, it is not a secret, I forgot to do photos, the nearest days I'll do it! I cannot understand what happens with my computer, I don't see my added replies! Thank you very much Natasha. You have sent exactly the information I needed. Natasha, Did you click the GO button instead of the ADD REPLY button? I see that the ryusa images moved to below my post. I hope that you did not have too much trouble! Tell you computer to stop that! 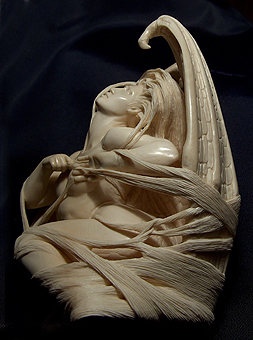 I find myself wondering how you orient the piece to be carved, to the grain or length of the tusk. 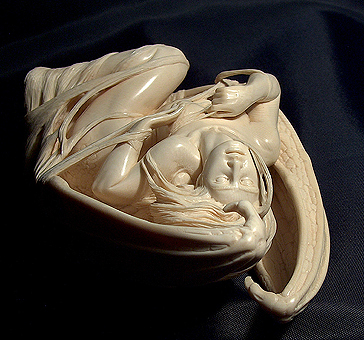 Is there a preferable way to place a carving, uh, I do not know how to say it, sorry. I know that there is a pattern when looking at a cross section cut. This might enter into the decision, to show it or to not show it, but are there other reasons to orient the carving into the length or crosswise cut? Hi Janel! Sorry, my English is not so good. I didn't understand what did You mean? 60 % (+/- 10%), keep them away from any wind in your home. I don't cover my pieces with tradition glue or wax, I use Super Glue (Ciacrine), it keeps my pieces very good, I can always control the surface, the Super Glue is deleted very well! If I see a crack I cover it with this glue, it stops the crack and fills all empty space in the crack. So if You decide to buy a piece of mammoth tusk You should buy that piece which was dryed about 5-7 years. 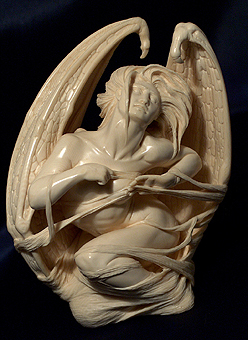 Only such pieces won't give You a bad surprise as a crack after carving. Never buy 1-2 years dried!!!! It is big problem! As a rule, the sawed surface covered with white glue and paper, that's why You cannot see any cracks, the second problem, You must dry it for 2-3 years before carving. So, the piece of mammoth tusk must be dried very well! Better to buy those pieces which have diameter minimum 4 inches and has no more than 1 crack (which looks like a diameter). So, if You have any question I'll be glad to answer! Grrrrr! What happens with my replies???????? Again trouble! Ah Natasha, the work is so beautiful and the explanations are wonderful. Thank you so much for sharing. About the mammoth tusk question. The tusk is basically a cylindrical shape. You cut the piece and have a disk that is round with two flat faces. These faces have end grain (as with wood), and you can see the arc patterns around the outer portion that are characteristic of tusk/ivory. 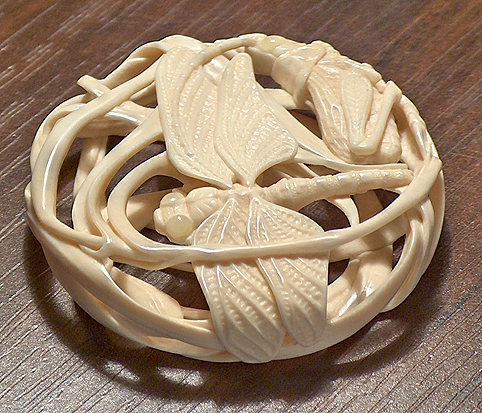 Elephant ivory has a different degree/angle than mammoth, the basic way to determine which is which. When you cut the disk in half or other sized portion, the cut parallel to the outside of the tusk, the newly cut face is side-grain or with the grain (again as with wood). My question is in regards to how and why you orient the carving across or with the grain of the tusk. Do you give any consideration to which way it fits into the tusk? Thoughts about where you might want to see the arc pattern, or not see it, in certain areas of the carving? Thank you so much for the detailed information about the nurturing of mammoth tusk. The piece I use was found in sand and gravel, and has a lovely uncracked portion. The broken end is cracked and very weathered, so I take material from the end towards the tip (though the tip was not included with it) The diameter is nearly four inches, and was described as from a female mammoth.